Please do not forget to post a vote for the one who you think should have immunity in the next round. Charlie Sheen won immunity in the last round and therefore is ineligible for immunity in this round. Richard Simmons decided that he was safest staying the night inside the Hollywood Tower and he survived the night without injury. Charlie Sheen and Miley Cyrus decided to team up and chased the beacon from both sides around the park. At one point, Miley shot at the beacon and Charlie stepped out to take a swing at it at the same time. Miley accidentally shot Sheen in the foot and Sheen let go of the bat and it hit Cyrus in the arm. Sheen managed to grab the beacon and activate it before falling over. Perez and Paris began to argue about who was the better Hilton. Paris gassed Perez with her perfume but as she made her escape, Perez sliced her head off with his Katana set to acid. She died as she lived. Brutally. This immunity beacon requires intelligence to activate. Only the smartest person in the group can use it. Who has the highest IQ? Altough he claims that he invented the "devil hornes sign" and probably the oxygen.. i'll give my vote to Simmons. 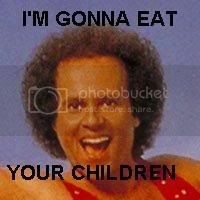 Lol my bad, and i just googled Richard Simmons he should have died in the 1st round! Asus Matx board, all custom watercooled in a Parvum s2.0 case. Dear god! he looks like chucky the killer doll!